failed and, as a consequence, an urgent need for Labour to describe clearly what an alternative and better policy should be and how it would operate. hence urgently needed restoration of Britain’s economic fortunes. economic failure to social dislocation and political disintegration. recovery has been delayed unnecessarily for more than half a decade and means that a return to pre-2008 living standards is still many years away. increased by3%, that means an average fall in individual incomes of 6%. The decline of the productive sector and particularly of manufacturing has meant that only 10% of our GDP is now accounted for by manufacturing -the lowest proportion of any major developed economy – and our share of world trade has fallen to just 2.7%. more than 60 years. According to data from the Institute of Fiscal Studies, average wages have fallen by over £1,600 since 2010, at an average rate of over £530 a year. The pre-Coalition reduction in median income (not the same as average wages, but an acceptable proxy), can be calculated at about £5,400 over thirty years (1980 to 2010) – about £180 a year – so that the Coalition has produced a reduction in worker incomes of almost three times the previous trend. much larger than official figures indicate. The burden imposed on working people has not of course been shared by the wealthiest people in our society. According to an Oxfam report1, the richest 5 families in Britain have more wealth than the poorest 20% of the population. That level of inequality is unprecedented since records began in the UK. three years and leaving them struggling to cover food and energy bills. The national scandal that millions of children in the UK are going to bed hungry is not some accidental by-product of Coalition policy. It is the inevitable and deliberate consequence of policies pursued by a government that is “of the privileged, by the privileged, for the privileged”. The disadvantaged poor – the disabled, the sick and the unemployed – have suffered, through cuts in their benefits, the greatest burdens in dealing with the recession. SCOPE, the charity supporting disabled people, have shown, for example, that 600,000 people in the UK lost a total of £2.62 billion pounds a year from Monday 8 April 2013 as a result of the Coalition Government abolishing the Disability Living Allowance (DLA) and introducing the new Personal Independence Payment (PIP), with tighter eligibility criteria and a controversial new assessment. The purpose of that change is not to improve service or to make things more fair but simply to save money. The lack of concern for the most disadvantaged in our society was compounded by the amazingly (and deliberately) inaccurate statements about incapacity benefit made by Ian Duncan Smith. five spending reviews since 2010 comes from women even though they earn less than men on average. Planned changes to tax credits, child benefits and public sector pensions were largely to blame. They came shortly after the government announced plans to cut the 50p top rate of tax for all those earning over £150,000. The failures of the Coalition government have extended into other areas of policy. One of the principal reasons for both the excesses that led to the Global Financial Crisis and the difficulty we have had in recovering from recession has been the absence of a responsible and supportive financial-industrial banking system in the United Kingdom. The Coalition Government acknowledged as much in “The Coalition: our programme for government”3 where they promised that, “We will reform the banking system to avoid a repeat of the financial crisis, to promote a competitive economy, to protect and sustain jobs”. system with the result that, as Mervyn King has regularly warned, a repeat of the financial crisis is still a major risk. detailed agreement on implementation.” The banking levy was introduced in 2010 and was intended to raise £2.5 bn, but has raised nothing like that sum. In the 2014 Budget, George Osborne restructured the levy to provide maximum limits for individual banks and five bands, which meant a cut that is disproportionally beneficial to the very largest banks. risk.” Less than six months after the Coalition came into Government, the proposal to deal with bonuses was abandoned. Bonuses are back with a vengeance. financial services, promote mutuals and create a more competitive banking industry” produced no action whatsoever, while a fifth to “develop effective proposals to ensure the flow of credit to viable SMEs … which will include consideration of both a major loan guarantee scheme and the use of net lending targets for the nationalised banks” produced an extra £80 bn of re-discounting of loans by banks, part of which may have proved useful to some banks who wished to reduce the bank levy, but which nevertheless produced a fall in loans to SMEs of about £56bn. culture. If the arguments against complacency and inaction have not been heeded now, when the crisis in banking standards has been laid bare, they are yet more certain to be ignored in the future when memories have faded. The list of failures demonstrates one central theme; because the Coalition Government does not understand the process of wealth creation at all, their focus is on the side-issue of making economies in the budgeted cost of government. 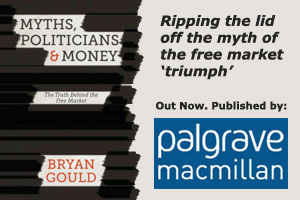 Their obsession with the objective of achieving a balanced budget blinds them to the fact that there is a much better way to govern Britain – a way that increases the wealth and welfare of all, as we will illustrate in the following articles in this series.